It may be some sort of evil suppressed killer from within, but for some reason I seem to be fascinated with dead animals. There is something about these decaying animals that sometimes speaks to me in a way that some may never understand. 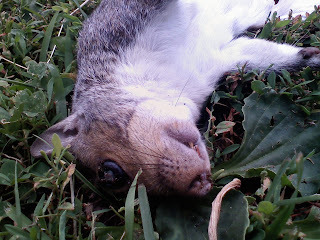 for instance this guy right here was found on my walk in a park. I found him on his side like so, with tiny little red ants tearing away at his eyes and open flesh wounds, the smell and look of decay gave it an estimated 24-36 hrs since it died. This bird here was your victim of everyday drivers. He was flying to low to the ground and made contact with a speeding car. Only to fall to the ground and succumb to the speeding tire of some beat up car. Sleeping like a little baby. Yet he fell high from the wires; and lays eternal. cause of death...poison; and perhaps to much sun exposure. another victim of road kill.